In order to shoot off small sphere magnets, I built a so-called "Gauss pistol". 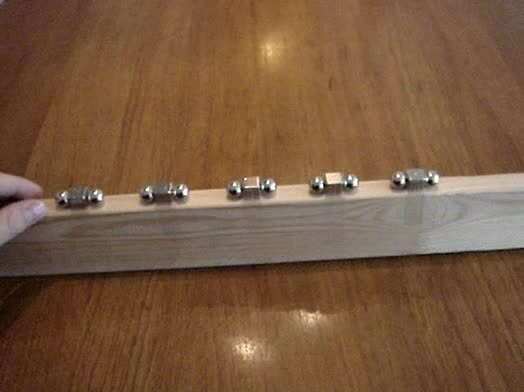 As shown in the pictures, you need to line up various W-12-N cube magnets (alternatively also block magnets) in a row and attach them to a stiff board or a rail. It's best to glue them on in a way so they attract each other. If they repel each other, they tend to twist on the adhesive tape. Then you place two steel spheres behind each magnet. To initiate the shoot-off, place another steel sphere shortly before the first magnet (the left one in the pictures). Note from the supermagnete team: A similar application is the project The Launching Pad.